After over 10 years of campaigning the UK’s commitment to combat operations in Afghanistan (Operation HERRICK) drew to a close in 2014. The army I joined in the late 1980s is a very different organisation to the army that exists today, not least as a result of the Iraq and Afghanistan campaigns. Leaving aside the changes in equipment, tactics and an operationally experienced cohort of commanders and staff, what is the legacy of these operations for UK defence and the British Army in particular? CDS stated that many people feel that our operations overseas have placed us more at risk, a legitimate if not entirely accurate perception and one which ignores both the ideological roots of the current conflict between the liberal West and Islamism; and the social, economic and demographic underpinnings of the Arab Spring. Furthermore the at best ambiguous strategic results of Iraq, Afghanistan and Libya have probably convinced people and politicians of the futility not the utility of force. This can be challenged, but only by educating and informing where we (the UK) went both right and wrong in our application of force and I see little sign of this happening yet. Significantly the Royal Navy, probably the UK’s most effective Service for the wider application of Armed Force has been largely marginalised in the public’s view since 2001, but has deterred, secured and fought on a global basis, demonstrating every day the utility of Armed Force and Armed Forces. CDS also makes the point: “Certainly, the understandable demonstrations of national grief which for a decade have attended the homecoming of our dead, have represented a significant challenge to our resilience as a nation, and our ability to sustain military operations…“. I have long felt that the increasing trend towards sanctification of our war dead is very likely to be counter-productive to our ability as a society to employ force efficiently and effectively. The simple fact is that it is becoming prohibitively expensive in both real and narrative terms to incur casualties. Yet without the deployment of land combat forces and the real risk of casualties both commitment and effect are likely to be seen as transient at best in the land environment. CDS is silent on the issue of the competence of defence. Yet it is here that the legacy is most troubling. 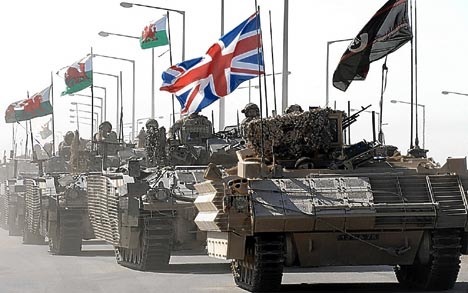 Three campaigns (Iraq, Afghanistan and Libya) which failed at the strategic level and two in which the UK arguably failed at the operational level (Iraq and Afghanistan). There appears to have been a significant loss of military credibility within Whitehall. As the former HM Ambassador to Kabul stated: “I am saying that at times and in places, one saw military advice to Ministers that was driven by a military view of the situation that was not necessarily the same as what the wider national interest might or might not be.” This charge of militarism is serious and has been echoed elsewhere. It seems clear that the way the wars were fought were very much left to the military and that the ways suited the military and in particular the Army. For instance maintenance of six month deployments for formations on operations guaranteed a minimum force level at a time when establishment levels were under review. A move to 12 month deployments apart from enabling greater continuity in Theatre (vital in any stabilisation campaign) would also have allowed more efficient use of troops (as well as troop efficiencies…). 1. What was the campaign plan for Basra and why was it so poorly resourced? 2. Why when the UK was arguably decisively under-committed to Iraq was the decision taken to open up a second major Theatre of Operations? Unfortunately the competence of defence is unlikely to be addressed by Defence. I say this in the basis of the very limited evidence I have seen of vigorous and transparent debate on the strategic and operational lessons from these campaigns. The Services are very good at tactical lessons, because these lie largely within their own remit and comfort zone, but operational and strategic lessons lie clearly at Joint Forces Command and Whitehall level and the politics here becomes murky indeed. As is so often the case in military reform the impetus for reform is likely to be external and the House of Commons Select Committee on Defence continues to do sterling work in holding the military and the Ministry of Defence to account, and I remain optimistic that the Iraq Inquiry will provide significant impetus for change. So what is the legacy from the UK’s 21st Century campaigns to date? Both Ledwidge and Fairweather highlight significant failings and call in question the Special Relationship. The Special Relationship was and is a pragmatic relationship invested in rather more emotionally by the British than the Americans. The fact of the matter is that in my extensive dealings with the US Military the Special Relationship seemed alive and well, although brand UK did seem tarnished; we are no longer seen as being as capable or as reliable as we might wish to be. Unlike the Australians we over-promised and under-delivered, however despite this and our shrinking size we remain the “best of the rest” in terms of size and capability. One should not forget that the US is also struggling with its legacy in Iraq and Afghanistan in much the same way as the UK is. Iraq and Afghanistan clearly demonstrated that UK Land Forces lack mass. If you want to have influence then you need to resource it. Arguably both Iraq and Afghanistan needed a division deployed on an enduring basis in order to both ensure that the job we had signed up for was resourced properly and to ensure that the UK retained the influence and prestige it though appropriate for a major player on the world stage and as America’s ally of choice. As we are highly unlikely to increase the size of UK Land Forces greater thought needs to be given to the overall UK force mix and the types of military operation we are likely to get involved in. Traditionally UK strategy has focused on using a strong navy for force projection while maintaining a small army. The British Military has demonstrated significant failings in its military strategic and operational decision making abilities. The picture is obscured by the fact that the UK was a very junior partner in a large coalition for both Iraq and Afghanistan, but without doubt serious errors were made in what were effectively treated as UK standalone campaigns (the sobriquets ‘Basra-shire‘ and ‘Helmand-shire‘ are telling). Without a vigorous and transparent debate about these failings these are unlikely to be addressed, and such a debate does not appear to be happening within the military at this time. The utility of force (hard power) is increasingly being questioned in the UK, as elsewhere in the West, despite the rise in the use of hard power elsewhere. Warfare are is increasingly seen as prohibitively expensive and of dubious efficiency. Both may be true, but human story shows that warfare is endemic to the human condition, and that while one may not go looking for war, war often comes uninvited. So a troubling legacy, but one which holds the seeds for reform of both strategy and military.